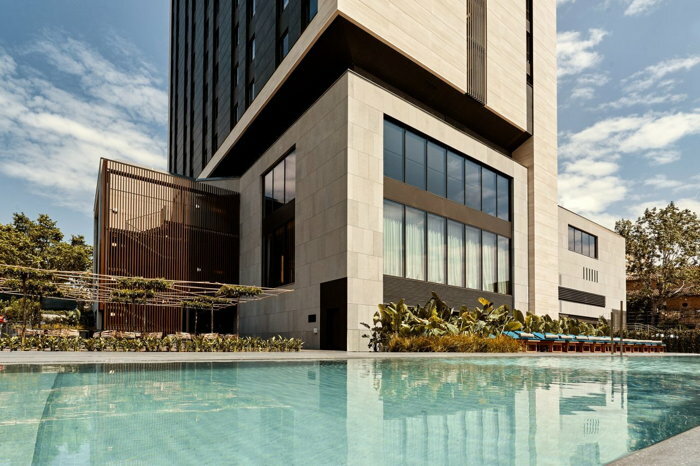 Hyatt Hotels Corporation (NYSE:H) announced today Hotel SOFIA Barcelona is joining The Unbound Collection by Hyatt, becoming the first Hyatt hotel in Barcelona and third property in Spain. The 465-room hotel is located on the Avenida Diagonal, one of Barcelona's main avenues in the heart of the city. Originally named after Princess Sofia, wife to the former King of Spain Juan Carlos I, Hotel SOFIA Barcelona has been known to host many dignitaries and heads of state. With the hotel's rich history paired with its contemporary and luxurious design, Hotel SOFIA Barcelona perfectly meets the brand's promise of creating story-worthy and unforgettable experiences. "We are thrilled to welcome guests to the first Hyatt hotel in Barcelona," said Felipe Espinoza, general manager of the hotel. "Hotel SOFIA Barcelona has long been a symbol of glamour and luxury in the area. Its rich history and stunning architecture will deliver an unforgettable stay for the modern traveler." The hotel's 465 sophisticated and completely renovated rooms are designed for those looking for a space they can call their own, tastefully designed and all with access to SOFIA Oasis Wellness & Spa. There are 18 luxurious suites guests can choose from including So Suite, which offers a large, open space featuring a living room, in addition to a spectacular bathroom with a bathtub and modern touches. All suites feature impressive views of Barcelona and access to the privileged "As You Wish" services, which include amenities such as a 24-hour butler, welcome gifts, access to the Wish Lounge serving daily cocktails and delicacies, and other personalized offerings. The hotel boasts five distinct gastronomic spaces with unique personalities, all of which have been carefully designed by interior designer Jaime Beriestain. IMPAR delivers Mediterranean fusion cuisine, while Sofia Be So is a more intimate luxury restaurant serving traditional local dishes with premium ingredients. For coffee or cocktails, the Sofia Bar offers the perfect spot to rendezvous. And, for a sweet treat, Philosofia is the hotel's own bakery, where everything is made fresh daily. The hotel also has its own live dining experience, Zuu, where guests can enjoy evening entertainment.